This year we see the next batch of exciting young female footballers coming together to form this season's International squad. 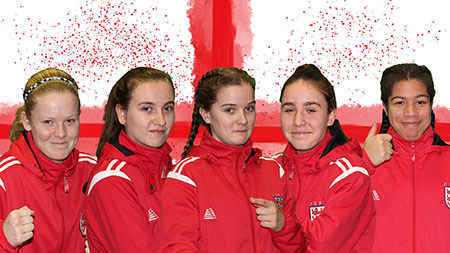 In recent years a number of exciting players have come through the ESFA international ranks to play at a very high level within the women’s game. Georgia Stanway is one of the former players that has played for the squad and has subsequently gone on to great success, playing for Manchester City in the Women’s Super League, representing England at Under 19 level and being nominated for BBC Young Sports Personality of the Year. Ellie Brazil has also played in the Under 15 Girls squad before going on to a professional career. She made WSL appearances for Birmingham City before being signed by Fiorentina. She has also made a number of appearances for England at Under 17 to Under 20 level. 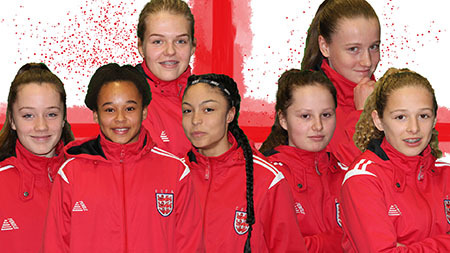 This season sees two goalkeepers, Lana and Kiya, who represent Buckinghamshire and Leicestershire respectively. Both keepers join us in the midst of very impressive seasons for their schools and counties and saw fierce competition in goal during the selection process. As a Manchester United fan, Kiya’s favourite footballer is David de Gea for his world class goalkeeping ability. Kiya comes from a family with football being a big part of her life and she is looking forward to the Republic of Ireland match. Lana was introduced to football by her friends taking her along to training sessions. This eventually grew into a passion for the game, she admires the goalkeeping abilities of Karen Bardsley and she has a growing collection of football shirts from countries and cities that she visits. This seasons selected defenders show the technical ability combined with footballing intelligence that all football fans love to watch. Ruby (Inner London), Safia (Worcestershire), Lilly (Staffordshire), Emily (Lancashire) and Amber (Dorset) make up this year’s defenders after impressing in the trials process. Amber is a Bournemouth fan and looks up to Steph Houghton as her footballing role model. 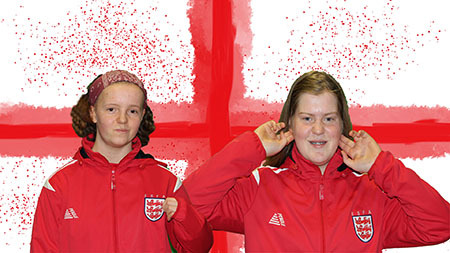 Emily was brought into football by her parents and her interest has grown over her success in the game, she is most looking forward to the game against Wales. She admires Cristiano Ronaldo for his dedication to football and his charity work. Lilly, or Lil to her teammates, is one of the standout technical players in the defence. She has an admiration for Marcello, the Real Madrid left back, for his all-round ability and work rate on the pitch. Safia is the 11th fastest Under 13 sprinter in England and models her game on another pacey centre back in Sergio Ramos. She also admires David Beckham for his ability to work hard while under public pressure and still deliver in football matches. Ruby was introduced to football through her parents, her favourite player is David Beckham for his ability. She is also a big Sherlock Holmes fan because he’s intelligent and suave. 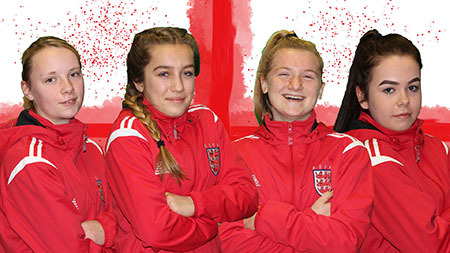 The midfield makes up the majority of this year’s squad which is testament to the number of gifted football players that are coming through girls' football in recent years. Sally, who plays for Cheshire, was introduced to the game through her schools system. She is a Manchester city fan and lists Mario lamina among her favourite players. She is something of a football connoisseur also enjoying watching Lyon and Paris Saint-Germain play. Tamara (South Yorkshire) was introduced to football through her enduring love of Barnsley FC. Kira (Somerset) comes from a footballing background and is a devout Yeovil Town fan. She looks up to both Alex Scott and Lucy Bronze for their ability and all they have achieved in women’s football. Alyssa (Lancashire) was brought to football by her Burnley supporting father and it’s clear she has inherited these afflictions from him. She has Irish heritage and is looking forward to the match against them in the Bob Docherty Tournament. Poppy (West Midlands) has inherited both her father’s love of football and Birmingham City. She is also a big fan of sushi. Lauren (Essex) is a West Ham supporter and has a love for ball playing midfielders. She lists Kevin de Bruyne and David Beckham as two of her favourite players. Mia (Durham) was introduced to football by playing with her dad and her brother, this took off when she became involved in schools football and her progress has been relentless. She looks to Paul Pogba as a footballing role model as he is a joyful person but is always mentally prepared when he goes on the pitch. The forward line of the Under 15 squad will make for very exciting viewing this season with a number of players who play a direct style of football with very strong dribbling ability. Libbi (Durham) was introduced to football by her brother, who converted her into a Sunderland fan. She has admiration for Lionel Messi for is direct dribbling a total control of the football. Mary (Lancashire) has grown up watching brilliant footballers and this is something she looks to involve in her own game. She is a Manchester City fan and tracks their progress closely in the WSL. The player she most looks to emulate is Neymar, for his fun loving style of football. Bebe (Dorset) fell into football by simply playing football in the garden. Her footballing education took place at Dean Court, the home of Bournemouth FC, the club Bebe supports. Bebe also looks to Steph Haughton as a role model for her leadership qualities and holistic approach to the game. Emily (Lincolnshire) is one of the skills wide forward in the squad; she possesses great dribbling skills, which she would have picked up from watching Lionel Messi and her beloved Doncaster Rovers. Emily also has Scottish heritage and is looking forward to playing them in the Bob Docherty Tournament. 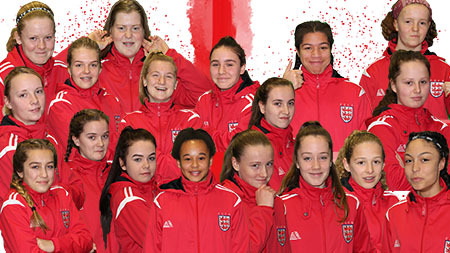 We welcome all the girls to this year's ESFA U15 Girls' Squad and wish them all the very best of luck with their endeavours. They are off to Holland this half term, thanks to International sponsors, inspiresport and then will play their first match in the John Read Trophy at Stafford Town FC on Saturday 10 March at 3pm.